I don't think it even qualifies as speculation. We *know* that certain things give a certain number of shards, based on seeing it happen over and over. I don't see any reason why that's not as good as staff confirmation. This... I mean, I don't think it even IS just speculation anymore IF it is supported with the evidence of multiple people having tested it out multiple times and getting a similar result. I mean, isn't that the whole idea of the scientific method? I am with HeatherMarie on this one... I think that list is probably good enough that we don't NEED TJ to give us an exhaustive OFFICIAL list. AND as someone else said, if you find something not included well, that can be added to it! Struggling to work out, are all the holiday dragons mostly male if CB? Snow angels, Ribbon Dancers and Garlands are all females.... Winter Magi, Snows and Aegises for INSTANCE are males! I would say that I support SOME sort of protection , especially during the holidays. That is... given the unfortunate history of attacks often being timed then. Even better, IMO, would BE some WAY of protecting things in trades. I made a mockup because I think people have a hard time visualizing a certain amount of characters. The above mockup used 100 characters (the current limit) for both Haves and Wants, so 200 characters total. I personally think this still looks OK, keep in mind it's not likely every trade will use all characters allowed. But I don't know if it's enough characters for some of our breeders who want to specify things. So if they do want way more space, perhaps it's important to think about ways to accomplish that without making the Trading Hub one big wall of text, with big empty spaces in between. Basically if you reach an X amount of characters, a (More) button would appear, and if you press that you simply get to the page of the trade itself. We could easily have a little 500 character limit box there and voila, people can properly include details of what they're looking for, and only people who are interested in the trade have to click it. Only downside I can think of (so far): bit harder to moderate. 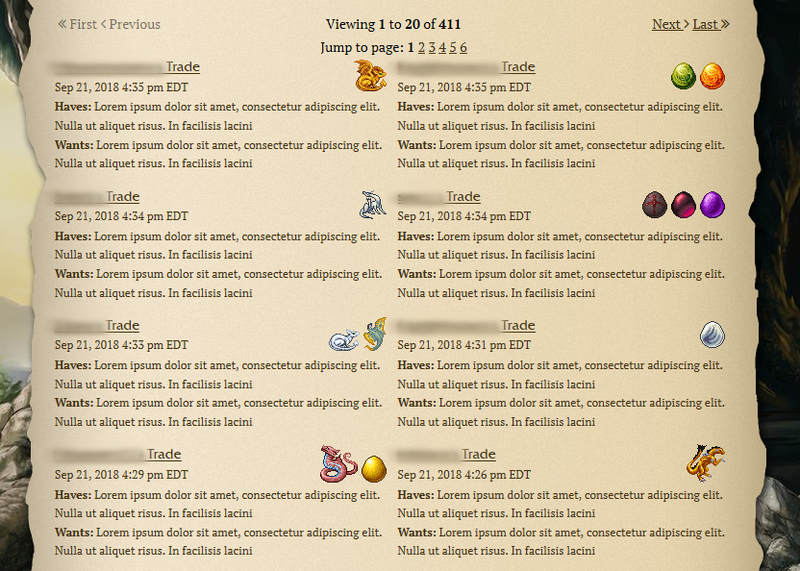 But I don't know if mods actually look through trades on their own, or only act on reported trades. If the latter, this shouldn't be too much of an issue, I think? I don't know. I would GUESS, and a mod may correct me here if I am wrong, that the mods probably only look at the ones that are reported. Speculation on my part, but I would ASSUME that there are probably far too many trades for our mods to have the time to handle each one personally and, since I would also guess the vast majority of trades and offers are non problematic, they only look at ones that are called to their attention, for whatever reason. From there, they deal with the issue as they deem appropriate. I wouldn't think that having a 'Have' section would change that all that much....anything offensive or otherwise in violation of rules can be reported and dealt with by mods just as it is, now. Honestly... I was a tad bit surprised when Halloweens didn't appear in the market during their 'breeding time'. It would make SENSE after all. I am in no way saying they should be there year around BUT if CB Holidays are going to be available IN CAVE... and in their own dedicate biome, no less..during their respective events then I think they OUGHT to be available in the market, too. Think about it! Stuff very definitely is available in stores for holidays that ISN'T the rest of the year.It would make life SO much easier for those who find they are having trouble grabbing that ONE last ... whatever it might be... in the cave to complete their goals. Isn't that the whole purpose of the market, after ALL? Honestly, I support this idea for CONSISTENCY-sake by itself, let alone all the other reasons I think this could be a VERY good thing! In fact! I support this idea quite on its own! Actually - not to be a totally wet blanket - but in general TJ may not even know. Isn't it up to US to set up and maintain such a thread ? Well, and actually, this is a valid point. After all, we as users are probably more likely to notice differences in the amount of views, clicks and such we get from a particular site day-to-day than TJ is. Perhaps it wouldn't NEED to be an official thing. Has anyone given a headsup to Allure's owner? There may be something they can do on their end. This is a very good idea.... though I am not certain WHO is in charge of that particular site. At said, may I comment that while I UNDERSTAND why EATW's owner decided they no longer wanted to deal with it, their shutting down their site because of the attack pretty much INVITED further problems by validating the efforts of the trolls responsible? It set a VERY bad precedent that I sincerely HOPE doesn't become a pattern. It seems to me that giving trolls... and I would add, just as importantly, US as the users of those sites... the idea that they have the power to permanently shut down a fansite ... I think was a bad step. Doesn't it pretty much ensure that, whether whatever is going on CURRENTLY is a an attack or not, there is always the THREAT of such a thing. I'd have HOPED that the owners of the rest of our fansites would have taken steps at that time to prevent their sites from being targeted next. At said, I often use AoND and I haven't had any issues.... though the last two few growing things I put on there were ER, anyway and I might NOT have noticed anything. I DO think some sort of public warning system for situations that seem suspicious, at the very least , is an order. I have never known the game do that and I think it's dangerous; I would want to be able to set it NOT to. Consider Bad People when I forget to log out.... I think it's a great safety measure that it won't allow that. I mean.... I can see if someone has an 'evil sibling' that would go on and release their scroll it might be an issue BUT... random hackers targeting my DC scroll? Probably NOT. Maybe I'm naive but it seems that the only ones at risk from this would be those with someone ELSE in their house who would mess with their scroll. AT said, for those folks the OPTION to turn such a thing on or off if it existed would be ideal. AND for those who are concerned about privacy issues and what not. Entered to win me some cute little BROCCOLI! Hey, IF my name isn't in the hat, I certainly can't expect to win, so... in my name goes! I particularly like my broccoli on a salad along side of its fellow vegetables, carrots, radishes and tomatoes! Good luck to all and thanks, Feesh! @sorenna personally I found multiple newer Halloweens (Omens, witchs, caligenes) CB in the AP. People also are more likely to have them by simple fact that they’re newer and thus the pool that missed out is a lot smaller than, say, the pool that missed Marrows. I think waiting three years to raise limits is excessive, with that in mind. - Make them available in the market during breeding week. I’d suggest a low price, but anything is fine so long as it gives people a backup option if they can’t catch them in cave. Personally I don’t think this is really NECESSARY, but it would fix a lot of the main concerns people have about raising limits. Actually, ADP, the solution you suggest sounds just about ideal to me. Yes, we have snow... not MUCH yet, mind you but it isn't EVEN Thanksgiving yet..... there is almost certainly more where what there is came from! A Snowy Christmas is the RULE rather than exception where I live. I must admit, I never even tried for more omens, as I was looking for more marrows and pumpkins. And let's not talk about the 6+ CB cavern lurkers I found in the AP and decided to keep anyway. However, getting a holly last year was tedious, although I did manage during low-traffic times. Still, I think that a full no-limits policy might be detrimental to the limited holiday dragons, as catching up on older breeds will be incredibly hard. How about a different approach: You can only catch two CBs of these breeds, ever - but you can buy more of them in the market? I... sort of LIKE this solution to the problem. PERSONALLY I would LOVE the opportunity to have TWO of both the enraged and pacified Aegis, just saying. HOWEVER, I DO get the concern about making it harder for newer players to get older holidays. ACTUALLY I was a wee bit dissappointed that our Halloweens weren't added to the market for the period of the event! MIND you I get that TJ is busy and maybe he just didn't get to it, but every other dragon that drops in the biomes appears there... and this seems a good solution. Yum! Although they are best as an ingredient in things! It succeeds often enough that it would help tremendously if that information could simply be tacked onto each hatchling trade. But then we'd get people complaining that the site gave misleading information, or that the trader was being misleading, or simply 'why did it say that and then gender like this??'... The 'note' or whatever would have to make it clear that Influence *can* fail, that an Influenced gender is not 100%. Quoting both of these for truth. I Can SEE the value of being able to tag it onto a trade ( And DOUBLE for precog which CANNOT fail AFAIK?). BUT I DO think a disclaimer that influences can fail might b helpful for those that don't already know.